It was the greatest finish to a Showdown ever. Except that it hadn’t finished yet. Yes, Robbie Gray, Steven Motlop and Co. combined to ruin what was shaping up to be a super Saturday, and your Fumbles correspondent seems to be taking things very hard. The good news is there’s an obvious gif to describe the final minute of Showdown 44. The bad news is… well, you know the bad news. Unfortunately this is one of those weeks where the bad news tends to outweigh the good news. To paraphrase The Simpsons, as we are wont to do here at Fumbleland, it was a helluva game and in many ways football was the winner. 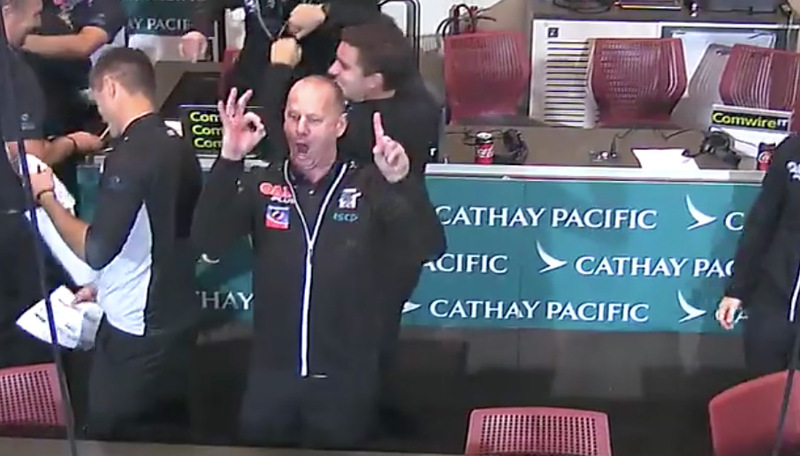 But in another, more accurate way, Port Adelaide was the winner. And you know what that makes us. 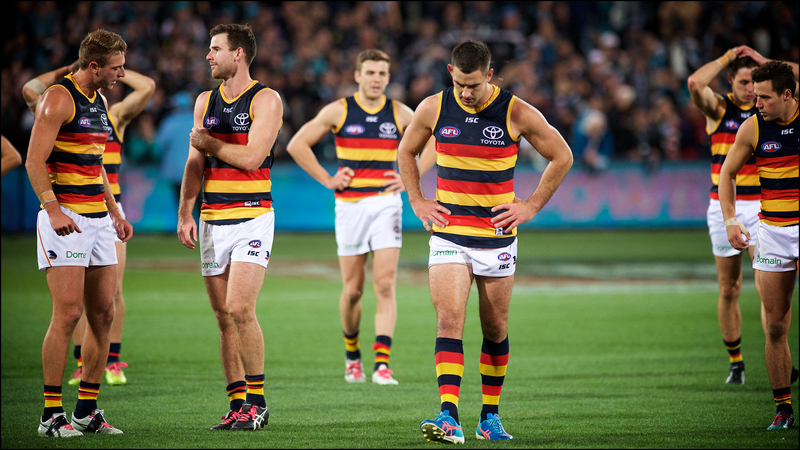 If the Crows had won, it would have been highway robbery, that unlikely flurry of goals in the dying minutes almost entirely at odds with the cadence of the second half. 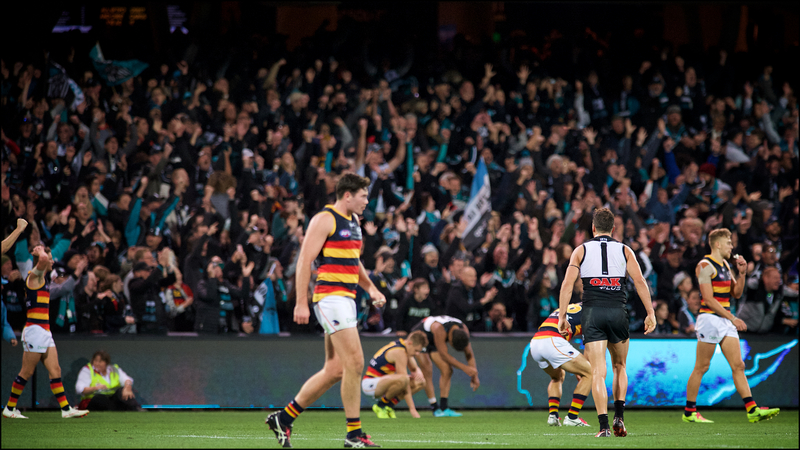 It was as strange a late rally, in its way, as Port’s was in that final Showdown at Football Park in 2013, when it felt as if the game was winding down with the Crows sitting on a handy lead only for the Power to pull four goals out of their collective backsides to pinch the win. Except, of course, that we forgot to pinch the win. Which, again, was a bit of a throwback to those days when we made a bit of an art of hitting the front late only to cough up the lead again. The 2012 preliminary final being the most notable case in point. It’s probably worth remembering that one this week if you’re feeling down about the Showdown, so that you can feel down about losing to Hawthorn instead. I once caught a replay of that game on FoxFooty, but had to turn it off after Johncock kicked the goal to put us in front as the final quarter wound down. It was actually quite cathartic; I’ve gone through the years since stubbornly believing the game finished at that point, making it one of our finest wins, even if the last quarter was a bit short. It’s actually quite an acceptable narrative practice: Hollywood producers change the ending of films all the time if they don’t go down well with the audience. In the first version of Fatal Attraction, for instance, instead of the spurned villainess stalking Michael Douglas with a butcher’s knife, she merely frames him for her own murder and he goes to jail. The makers of The Shining and 28 Days Later similarly trimmed some unnecessary padding from their final reels. So I’d suggest something similar for Showdown 44. It was ticking along pretty nicely for a while there (the third quarter notwithstanding, but you can’t have a Hollywood script without a bit of drama and suspense, can you? ), but the last 40 seconds didn’t really work for me. I’d suggest excising everything after the bit when the umpire called back his wayward bounce after McGovern’s goal. 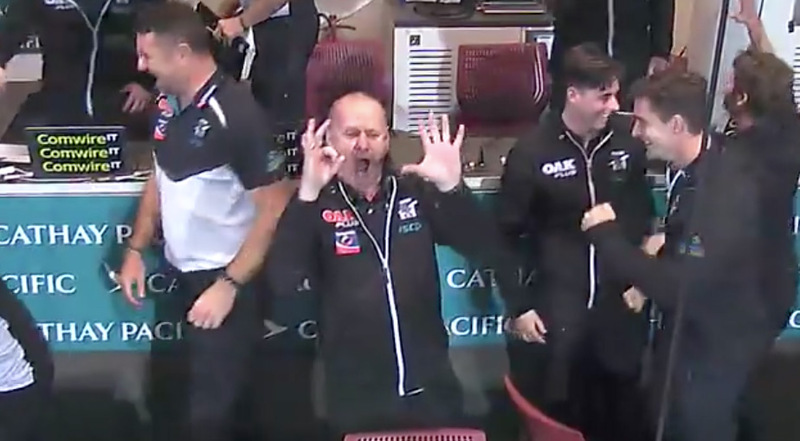 That way you’re left with a one-point win, a victory for the ages that simultaneously ensconces Adelaide in the top three while consigning Port to the bottom eight. It also means you avoid the post-siren spectacle of the baying hordes, such as the one Port nuffy I saw gesticulating wildly in lunatic celebration. Oh wait, that was Ken Hinkley. Apparently ‘Crazy Ken’ was simply trying to point out that Port were previously 5-0 in recent Showdowns, but were now 1-0. Which, of course, makes perfect sense and is not at all strange. But while the Power coach’s Very Normal Behaviour became something of a post-game flashpoint, the talking point before the game was the new Showdown shield to be awarded to the winner. Which, in case you forgot, was Port Adelaide. It depicted some brotherly Bond love after the second derby in 1997, which was all very well and good, but I’d prefer they’d picked something more symbolic of the Showdown rivalry. The punch-up at the Ramsgate, for instance. Or Tex holding a fuming Charlie Dixon while Tom Lynch gives him a jolly good talking to. I mean, there’s nothing wrong with family ties per se, but the underlying theme of the Showdown rivalry isn’t so much brotherly love as tribal loathing. Hell, in ten years they should probably emblazon the plate with an image of Crazy Ken counting on his fingers. For the first time in some years, I opted to save myself the novel experience of attending Port’s home Showdown, which was probably for the best all things considered. I at least saved myself a ride home on the Footy Express surrounded by celebrating Power supporters, which is probably as close to Hell as anything John Milton ever dreamt up. After all, if there’s one thing I don’t miss about Football Park it’s the interminable bus-ride of shame after your team loses horribly. If standing around sharing the stunned silence with a bunch of strangers as you collectively ponder the futility of failure wasn’t bad enough, it was always compounded by the inevitable effects of excessive beer consumption while the city-bound bus crept on its petty pace up Port Road. This combination of empty hearts and full bladders made for one of the more unpleasant ordeals one could reasonably expect to put oneself through. Adding the baying Power hordes into the mix would probably push it over the edge into the category of experience that should actually be outlawed under the Geneva Convention. So instead, I hightailed to a local pub to watch the game with some mates. There were a few kids present, which meant I had to curb my natural inclination to loudly and repeatedly hurl invective at an entirely unresponsive television screen, and instead opt for a far more diplomatic response to the loss. 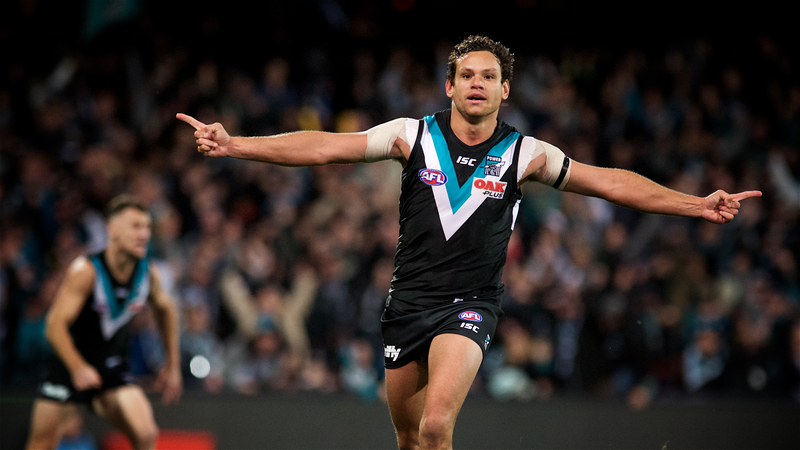 For besides losing finals (which we’ve got pretty much down pat in any case), there’s not really a worse experience in football than losing to Port Adelaide. And I think, on reflection, I’ve worked out why. It’s not just because of the rivalry, or the tribal loathing, or even the interminable Bus-ride Of Shame home at the death. On any given weekend, there are two footballing scenarios that can buoy my weary spirits. The Crows can win, of course. And Port can lose. Thus, if the first scenario fails to materialise, there is always the prospect of some consolation via the second. It’s a way of hedging your emotional bets. But in a Showdown, all your chips are on the table. It’s double or nothing. If you win, all is right with the world. But if you lose, there’s no consolation. And if you lose after thinking you’re going to win, and you have to watch Crazy Ken doing his weird finger-counting thing in the aftermath… well, that’s a bad weekend. 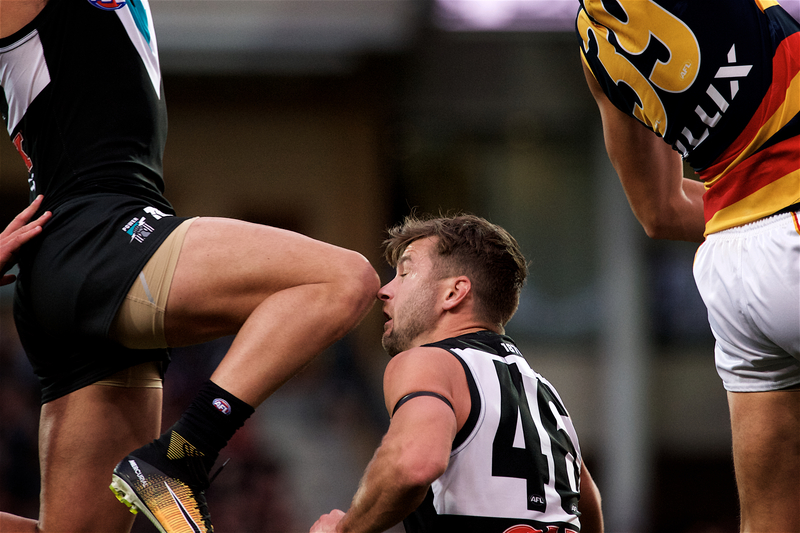 Compounded by the fact that it was utter vindication for Port. They brought Powell-Pepper and Rockliff in to toughen them up around the contest, and they duly smashed us in contested ball. They brought Motlop over to add some pace and finishing finesse, and he duly sped through a murder of Crows defenders to kill us on the scoreboard at the death. Speaking of which, for all the focus on the absence of the likes of Sloane, Brad Crouch and Milera, we really could have used Kyle Hartigan in that third term. 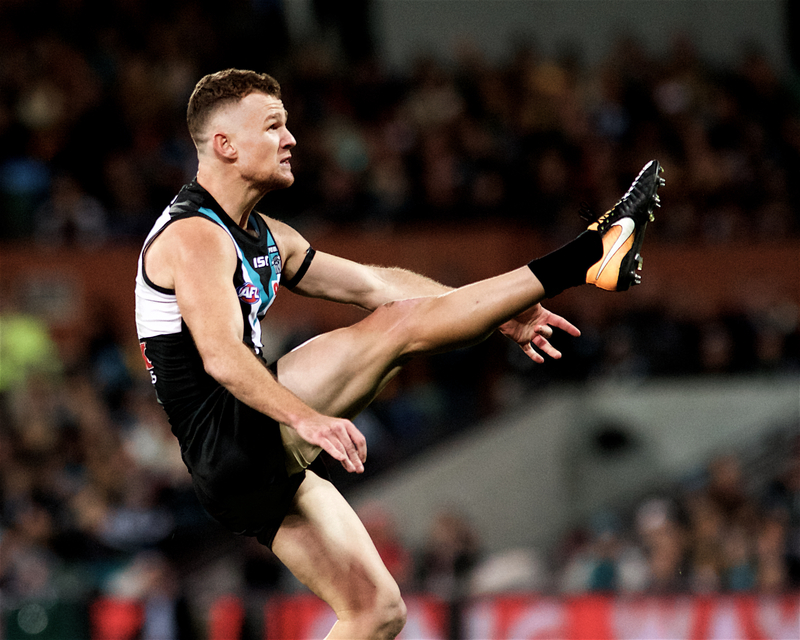 Y’know, the one where Robbie Gray kicked five goals? Five. Five freakin’ (and freakish) goals. In one quarter. Hinkley was probably doing the maths on his fingers in disbelief. I could argue it was a consolation that the Adelaide players dug in at the death instead of allowing the game to meander to its seemingly-inevitable conclusion. Or that there’s a valuable lesson in discovering that our 2018 strategy of only turning up for three quarters won’t always be enough to get us over the line (the fun part on any given week is trying to guess in which quarter we’ll drop our bundle). But in truth, there’s no consolation for a game like this. We had it, and we lost it. Except for one thing. One small pathetic hint of solace on a grey Monday. Which is that the last time a team so spectacularly coughed up a game after hitting the front in the dying seconds, they went on to win the flag. Sure, they did it at our expense, but at this point I’m willing to take consolation from anywhere. It’s in short supply this week.